Writing can be a rather solitary venture; it’s not a pursuit usually requiring the company of off-duty ballerinas, eager to break into dizzying dance sequences at a moments notice. 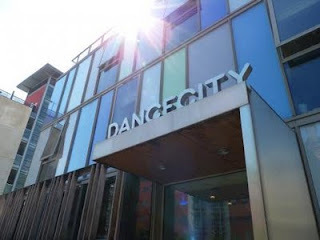 Yesterday I had the pleasure of attending a Writing and Dance Workshop at Dance City, a location which has always intrigued me, due to its rather evocative air of artistic permissiveness. I did this out of a combination of intrigue and duty. I’ve just started researching my second novel, Letters From Yelena, which is set in the world of ballet. I was keen to move my research beyond struggling to decipher Russian ballet websites and into the real world. The workshop was organised by the award winning Write Around The Toon, which is Project Managed by the author Viccy Adams. The workshop was ran by Alex Lockwood, a lecturer at Sunderland University. Until yesterday I had steered clear of writing workshops due to a rather precious fear I had about reflecting on the writing process, which I've fumbled through on my own over many years. But the workshop was an inspiring and somehow liberating experience, and in a matter of hours it blew away many of my misconceptions about creative workshops. In it we were encouraged to explore our own conceptions of dance, to spend time amongst the dancers and to reflect on the creative atmosphere of the setting. The dancers offered an interesting juxtaposition next to the considered thoughtfulness of the writers – many of them flexed cautiously in corners, ready to break into a flurry of moves at a moments notice. As we clutched our moleskin notebooks (mine was £1.99 from the post office actually) and scribbled out observations, lycra clad limbs gambolled and stretched all around us. After watching clips from the recent show Singing Light, choreographed by Stephen Petronia, we improvised snippets of creative writing, and were coaxed into sharing them with the class. Personally I shared the concerns of one rather lucid fellow attendee, who expressed her reluctance to ‘sound like a bell end’ in so doing. I was impressed by some of the vivid, colourful and sometimes very funny pieces other attendants seemed able to deliver at a moments notice. I initially resisted reading out my vague, formless scribblings to a roomful of strangers, before gradually warming to the idea amongst the bonhomie of the environment. I came away from the workshop with a sheaf of new ideas, a notebook full of needed details, and a renewed appetite for dance. Write Around The Toon are offering a series of mini-residencies across venues of interest in Newcastle over the coming months. I would strongly recommend going along to them if you have an interest in developing your versatility as a writer.You can find out more about Write Around The Toon at http://www.writearoundthetoon.co.uk/.